This week marks the entry into the third year Marian Price is interned without trial and is incarcerated on the word of a British Secretary of State. Where is the justice in this maltreatment of a defenceless woman whose health has deteriorated according to reports to a level that she is almost unable to function as a whole person. Her incarceration in solitary confinement is responsible for this deterioration, firstly in Maghaberry, then Hydebank and now in hospital. Health professionals have revealed home care packages to treat Marian in a humane way and to date the British Government have refused to grant her that humanity. The long drawn out process in recent times still has not revealed an outcome, all the while Marian continues to suffer and has renewed treatment in hospital. Fifteen years on from the signing of the British Agreement, the treatment of Marian Price and others exposes that the injustice suffered at the hands of the British establishment hasn’t gone away. 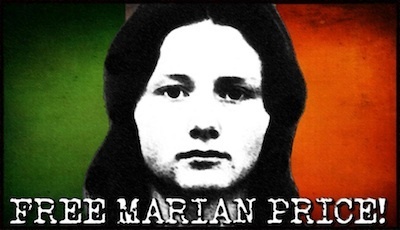 The analysis of the Irish people throughout our history that there is No British Justice in Ireland is epitomised again with this deliberate maltreatment of Marian Price. How much more can this woman and her family suffer, how much more are the politicians prepared to make her suffer before moving beyond lip-service to her torture. Marian Price should be released immediately on humanitarian grounds due to the state of her health but she should also be released as a right because the spurious charges against her are not proven and innocent until proven guilty has gone out the door. Marian Price is serving a sentence of inhumane treatment for the past two years and yet is not sentenced to a single day in gaol. Where is the Justice?